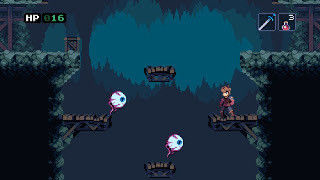 Bit Kid, formerly Discord Games, the developers behind Xbox Live Indie Games titles Take Arms and 48 Chambers, returns with an action-RPG that mixes roguelike and Metroidvania elements. Chasm focuses on exploration through a procedurally generated cave system as you fight your way through enemies and bosses, grab loot, hunt for secrets, and hopefully return home alive. Players are able to equip weapons and spells, along with armor and passive buffs, as they fight enemies to gain experience points and level up, similar to the neo-Castlevania titles. As is typical of rogelikes, the dangers increase as you descend further into the depths of the mine, but you may return to the surface to do things like purchase weapon upgrades from the local blacksmith before heading back into the fray. The game is now available for PC, Mac, and Linux via Steam and Humble Store, and PS4 and Vita via PSN.